Today is one of those crisp winter days that makes you think you should don your Wellies and go for a walk in the forest. We don’t live next to a (small) forest like we used to when Pieter was little, but I figured I’d venture out into the neighbourhood for a bit of fresh air and inspiration. I got to the end of the road before the South African in me reminded the England-dweller in me that we do not do cold very well (at all! ), so I abandoned the endeavour and rushed home to my new Ginger and Lemon tea and my fluffy dressing gown (don’t judge). I think that sitting here (warm) and chatting to you is a much better use of my time today. Before I ventured out, I was working on the patterns for my next yarn retreat with Daisy from Devon Sun Yarns. All the while, I kept humming ‘Oh I do like to be beside the seaside…’ I was going to use my walk to figure out exactly what it is that I love so much about being by the seaside, especially with a group of yarn-loving women, but since the walk didn’t happen, I’m going to reminisce about the last retreat instead. Next weekend’s retreat will be the fourth retreat I have done with Daisy, and I still pinch myself every time to make sure that I am not dreaming. 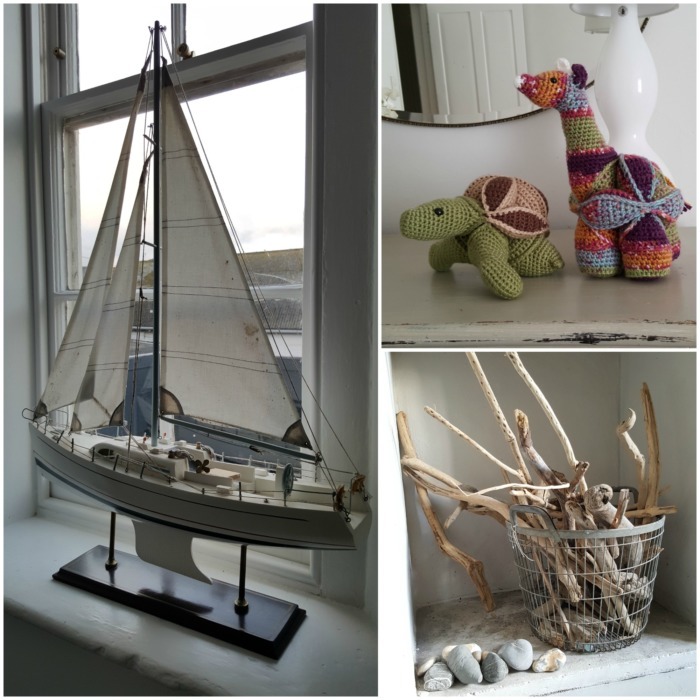 My first yarn retreat in November 2015… I don’t even know how to describe it (well, I tried to in THIS POST, but words fall short). I love beauty and beautiful things. I know every other human on the planet likes beauty (be it in the eye of the beholder, or not), but some people look for conventional beauty, and some people try to find beauty in the unconventional. I actively look for the beautiful. The house we live in now is ugly (apart from the wallpaper in the alcoves, which I put up myself because I could not stand the brown/gold/papyrus paper that was there when we started renting). I have tried and tried to find the beauty in it, but there is none (apart from said wallpaper, which doesn’t count when viewed against the mottled brown carpet). 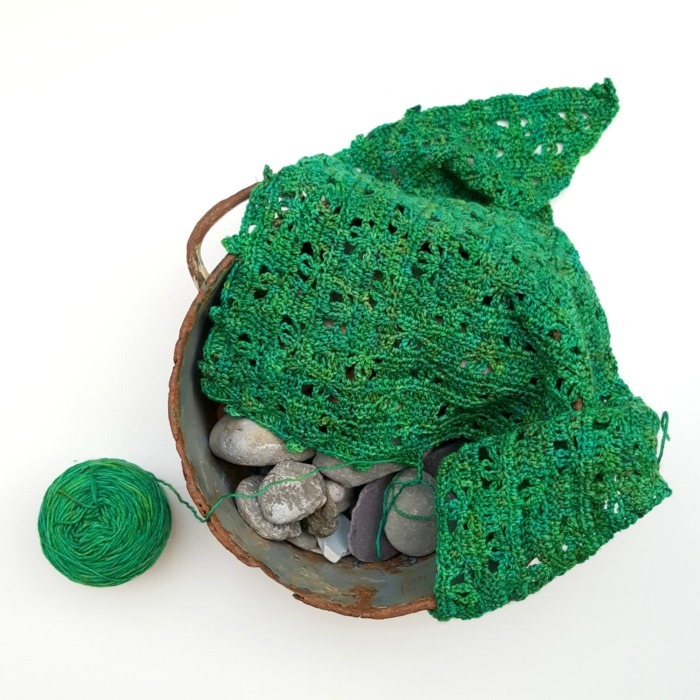 I look at other people’s photos of their crochet projects, displayed in open white-washed living areas and against opulent shag rugs, and my heart sinks. Somehow Sophie just doesn’t look as pretty draped over a cheap pine chair in a cluttered studio/dining/storage room. So when I went to my first retreat with Daisy and saw the beautiful white-washed rooms with their pretty furniture and wooden floors, my heart sang! Finally, I could take photos in a pretty setting! Not only a pretty setting but a pretty setting by the sea! This beauty is not the thing I love most about the retreats, but it speaks to my most basic need. The thing I love most about the retreats is the people and the sense of ‘belonging’; it is the fact that you can sit around in your pj’s at 11 am with a bunch of strangers and feel as ‘at home’ as if you were spending Christmas with your family (with none of the inevitable drama). I also love the food! Daisy is an exceptional cook. I keep telling her that she should share her recipes! She also has the coolest kitchen gadget ever: a Thermomix! I haven’t even bothered asking Santa for one, because they cost a bazillion dollars. 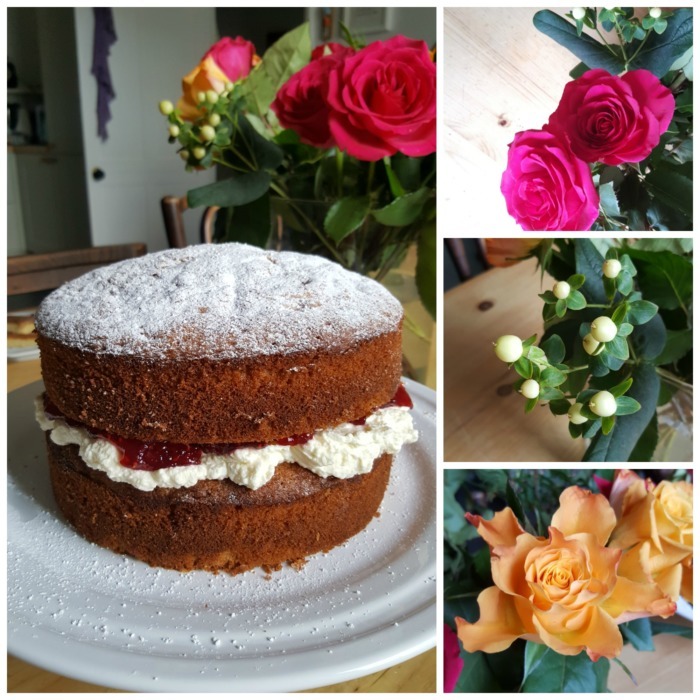 Daisy is also a wonderful baker! No retreat is complete without a cake (or three). 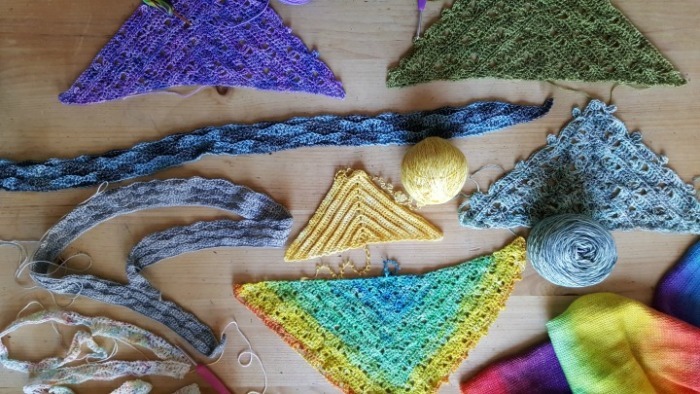 I usually design a pattern for each retreat, but for the last retreat, we gave the ladies a choice of the two patterns I had written for the previous retreats: Lazy Waves Shawlette and Banksia Shawl (pattern to be posted soon). They also got to choose any of Daisy’s yarns to complete the project with. 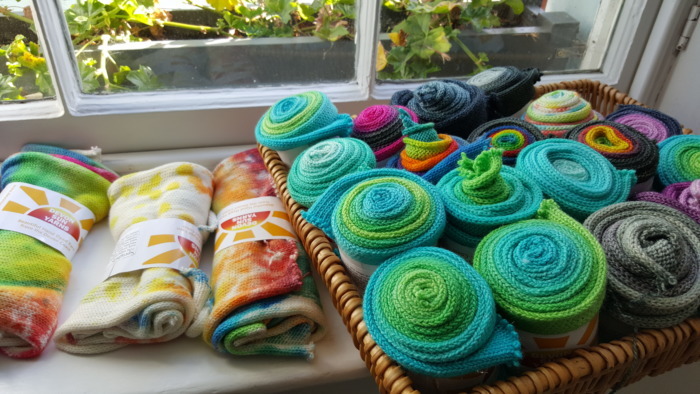 I chose one of the sock blank rolls, so I didn’t have to wind my yarn into a cake because you can crochet straight from the sock blank. Some of the ladies chose skeins, so those needed to be wound into cakes. I always enjoy winding yarn much more at the retreats than I do at home. There is something soothing and meditative about watching the yarn slip through your hands to the sound of 10 women counting and chatting. 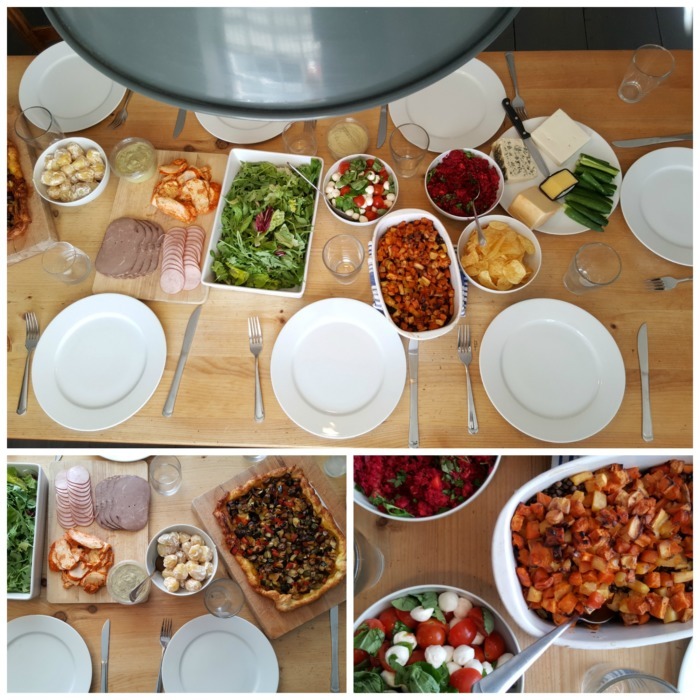 None of us managed to finish our shawls over the weekend, but that’s probably because we spent so much time chatting and eating! The most creative moments at the retreat? When everyone dyes their own yarn. 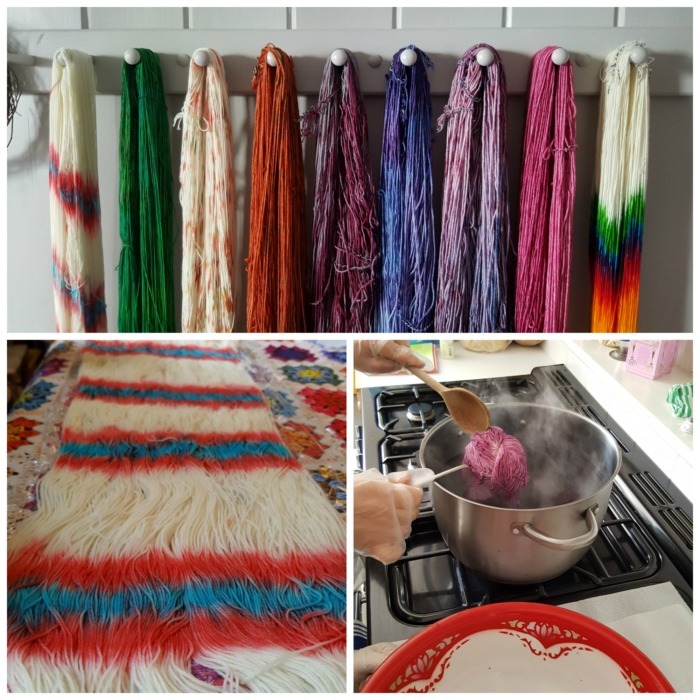 It is wonderful to watch everyone express their personalities and likes through their choice of colours and dyeing techniques. 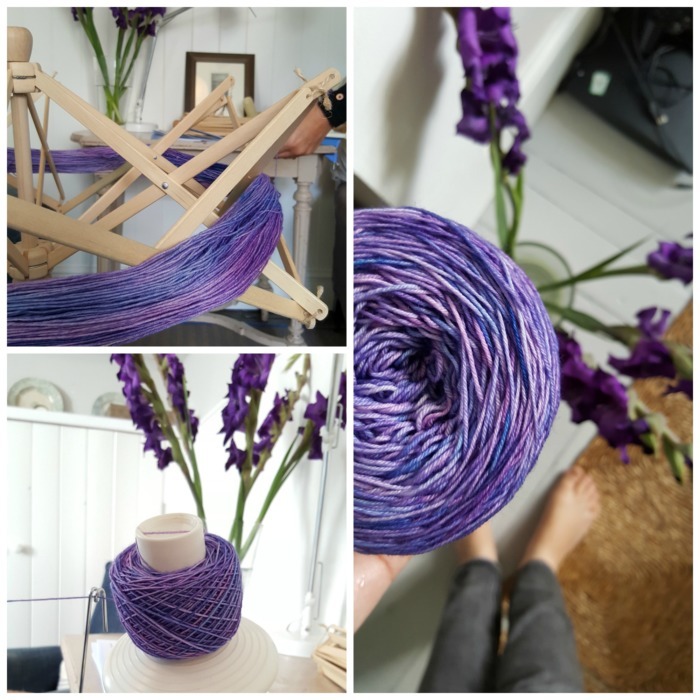 Every time I dye yarn, I become a little bit more daring. At the February Retreat, I dyed two vibrant yellow skeins which I am now using to knit socks (very slowly and with the guidance of my dear friend Sarah from Crafts from the Cwtch). At the time, I absolutely LOVED my yellow yarn, but looking at it now, I wish I had been a bit less ‘safe’ when I dyed it. This time, I chose to dye my yarn green with flecks of yellow and purple running through it. I am using it to make another Banksia Shawl. The pot in the photo below was part of my ‘fossil hunting haul’ at the first retreat I attended. 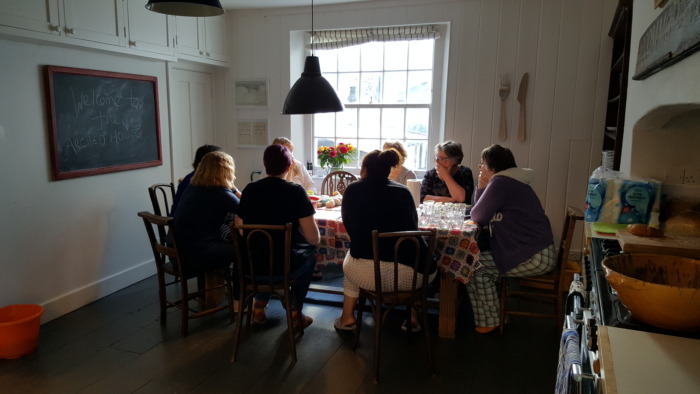 Apart from yarn dyeing, the retreats also include other workshops. 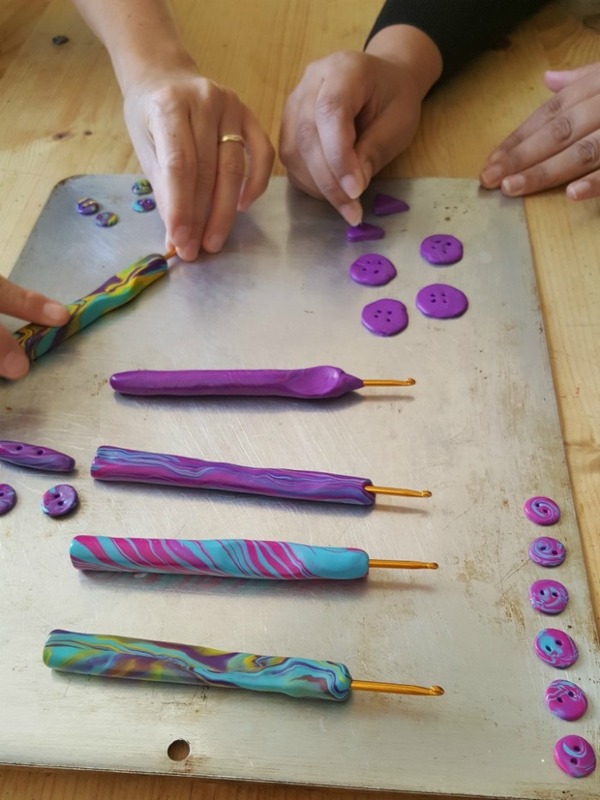 Usually, Beth from Koru Tumi will host a workshop on making your own ergonomic hooks. 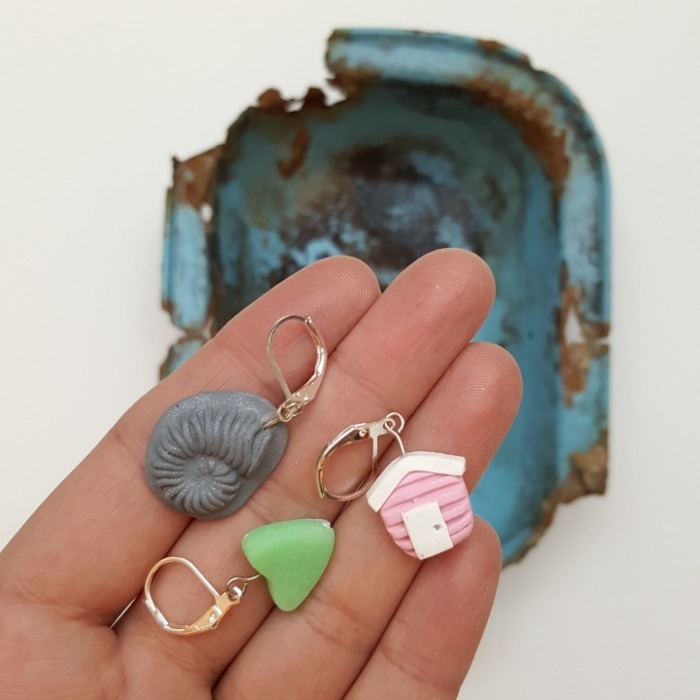 She makes the most amazing crochet hooks and stitch markers, and if you subscribe to Little Box of Crochet, you will already own some of her stitch markers (there’s a photo of some stitch markers right at the start of this post). Beth was unable to attend last time, so Daisy showed two of the ladies how to make their own hooks while I showed the rest of the ladies how to ‘cut and fix’ crochet to avoid having to frog (rip) back a thousand stitches. On top of that, Hester from Bodkin Creates (@bodkincreates) came to teach us how to make Dorset Buttons. I had so much fun, even though my button didn’t look nearly as pretty as some of the others. The fossil hunting throws me right back to my childhood, digging for treasure in the fields on the farm. I get childishly excited when I spot a fossil or a piece of broken pottery (or the undercarriage of an old car…yup). In 2008, there was a huge landslide in Lyme Regis which unearthed an old dump site. 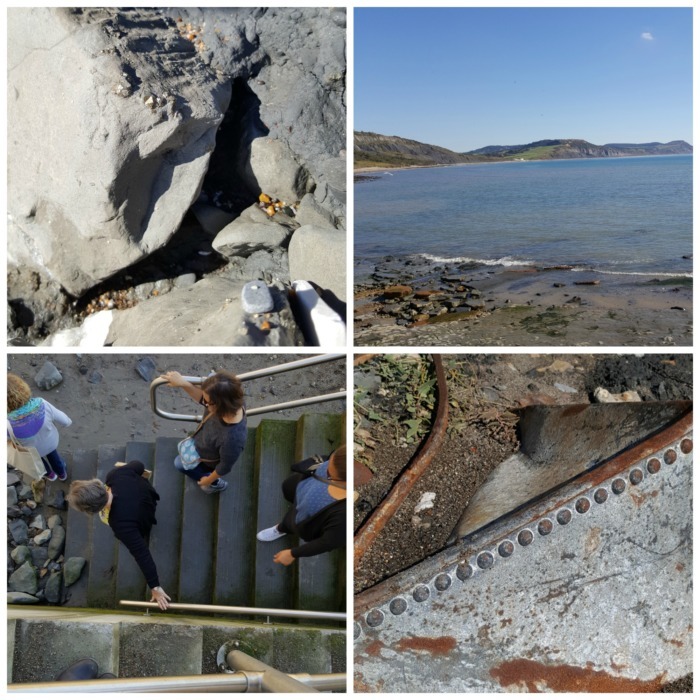 The dump dates back to Victorian times, so my best finds (apart from fool’s gold and ammonites…you know…actual fossils) have been old glass jars, an enamel pot, and an enamel baking dish (there’s picture of it at the very start of this post). And now it is time for me to venture out again to go and fetch the boys from school. Wish me luck! Our next yarn retreat is on the 9th of December (I have it on good authority that Santa will be doing a special early delivery for us) and there is only one space left. You can find the details HERE.